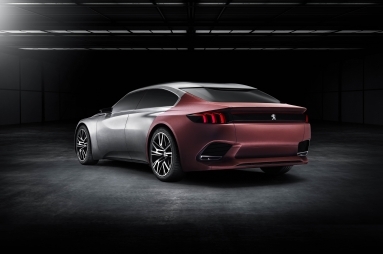 With EXALT, PEUGEOT unveils its imposing vision of the saloon car by following the approach initiated in 2012 with the Onyx Concept. EXALT aims to please the senses. It stands out at first contact by its radical styling choices and the materials selected. First seen on Onyx, the distinct line in the bodywork is reinterpreted by the association of bare metal and an efficient textile, Shark Skin, inspired by the unique texture of a shark’s skin. 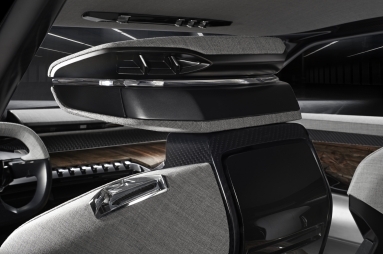 The remarkable acoustic comfort achieved inside permits the discovery of an array of materials – natural wool-based ‘chiné’ mixed fabric, aged leather, bare steel and ebony – used to finish the cabin. This high end variety of wood takes on its Chinese identity through the design created by the trio PINWU Design agency. 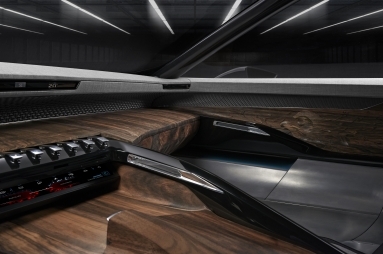 The technology incorporated makes every journey an experience: PEUGEOT i-Cockpit, black light, Pure Blue air purifier … this art of travel is powered by a petrol HYbrid4 drive train with an output of 340bhp. 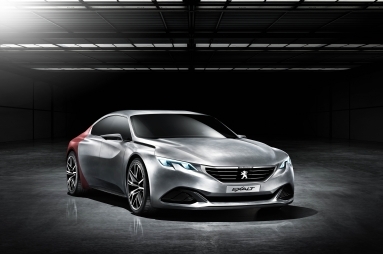 With its sleek and athletic lines, EXALT embodies the power of PEUGEOT design. Sitting on wide tracks and powerfully rounded wheel arches, this five-door saloon expresses its style over a length of 4.70m. The alliance of flat surfaces and straight cut lines reconciles aggressiveness and softness. EXALT chooses to be radical by deleting all superfluous materials, keeping only what is really useful. Its specification comprises materials from the melding of cultures with French and Chinese expertise. Each one of the materials used has been rigorously selected for their efficiency. In homage to the art of the French motor car from the twenties and thirties, its bare steel bodywork is hand-formed by a master panel beater. One of a kind, it reinterprets the historical cues that make up automobile passion: taut and dynamic lines, a high waist line, a raked windscreen, a low roof (just 1.31m), a very slender profile that conceals a cabin that is still spacious, tightly shaped side panels with basalt fibre sills and 20-inch wheels. The long bonnet grows out of the particularly expressive front end where the twin headlamps, set in the bumper, integrate the Brand’s recognizable signature lighting. 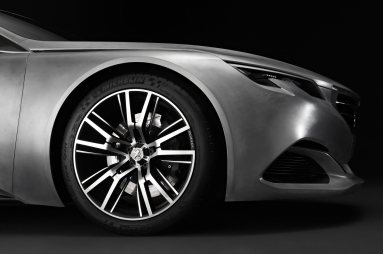 In the middle, the powerful grille emerges from the bodywork and provides the backdrop for the doubly symbolic lion. This is because this animal is both the emblem of the Brand and in Chinese culture, the expression of power and prestige. At the bottom, the flow of air supplying the engine is divided by ‘fins’ carrying the LED direction indicators. To improve the drag coefficient, the rear of EXALT is trimmed in Shark Skin, an efficient textile. Due to its technical grain structure, this material resulting from bio-mimicry markedly improves the aerodynamic performance of the vehicle, with the aim of reducing fuel consumption. Its use is elevated by a straight line making the transition between the rear door and the quarter light, the transition between the grey of the steel and the red of the Shark Skin. This material contributes towards EXALT’s aerodynamic performance – with an SCx of 0.6 – in association with other elements: an air extractor in the rear bumper, the curve of the roof and the profiled mirrors. With such remarkable aerodynamics, the mark left by EXALT on its surroundings is essentially visual. 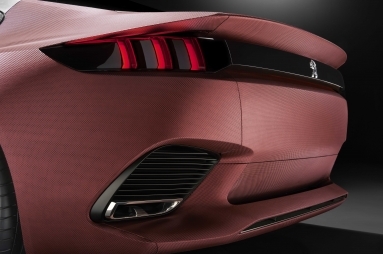 A horizontal band in the hollow of the rear spoiler shows the width of the car and the sculpted facet of the lighting signature. 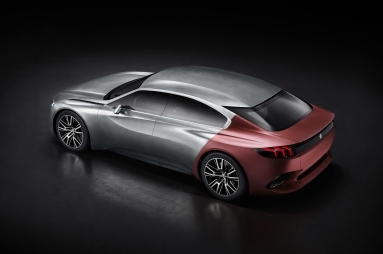 PEUGEOT EXALT also provides exceptional versatility for a saloon. The boot works with an innovative pantograph mechanism. This arrangement allows maximum opening while needing less space externally. The boot with its integral motorised aperture reveals a boot with a low load sill. Trimmed in wood, it presents a delightful space and facilitates the handling of luggage. 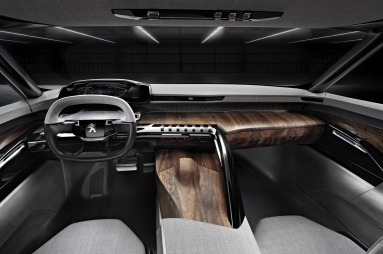 The PEUGEOT i-Cockpit delivers an intense driving experience dedicated to enjoyment. 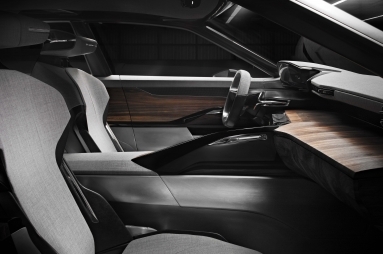 The small wheel trimmed in leather and ‘chiné’, a natural wool-based mixed fabric, and the digital instrument panel are intuitively arranged in front of the driver for improved operation and reading. 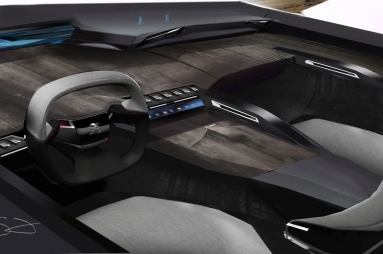 On the extended centre console, two folding touch screens emerge from the dashboard. The upper screen gives access to the on board computer and the Hi-Fi and navigation systems. The second screen presents a permanently visible control bar to provide access to the automatic air conditioning and the Pure Blue system. 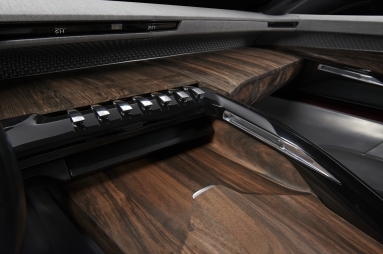 Nine Toggle Switches are located on the dashboard, evocative in their design of the world of music. They are arranged in two groups, two to the left of the small steering wheel, seven to the right. This distribution was adopted because of the human brain’s ability to easily remember up to seven elements, for their position and their function. Furthermore, the driver is free to associate Toggle Switches with functions, as desired: access to navigation with a particular switch, vehicle settings with another, etc. Activation of the black light system can also be assigned to one of the Toggle Switches. Built into the headlamps, this system is particularly useful during the transition between day and night. Visibility issues are reduced and driving becomes more relaxed with black light, improving the observation of road markings. “Our approach is to have a responsible attitude. 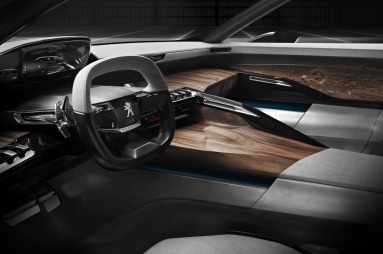 PEUGEOT EXALT is made of raw and natural elements associated with innovative and efficient materials. The idea was to finish the car with useful touches and to do it intelligently with the constant objective of optimising processes to economise on the use of materials and reduce waste. Regarding the work carried out on the body of the vehicle, bare steel is used to accentuate the expressive lines of the vehicle. Associated parts such as the wheels are also in bare steel in order to highlight the markings left by the milling machines. Steel remains bare in all areas where it does not come into contact with the bodies of the four occupants. At the elbows and arm contact points, EXALT is trimmed in warm toned wood. From the bottom of the windows, it gives way to a natural wool-based ‘chiné’ mixed fabric used to trim the door panels, the dashboard and the interior roof. Between these two materials, a strip made by 3D printing conceals the speakers of the Hi-Fi system. Its structure draws inspiration from anechoic chambers where the dihedral partitions reduce acoustic interference. 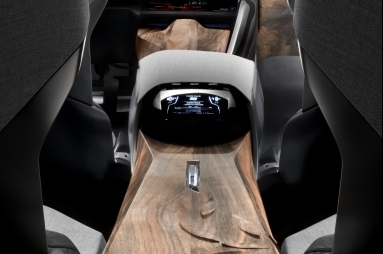 Each occupant has a special welcome on board the PEUGEOT EXALT, whether the driver or a passenger. The bucket seats made of composite material incorporate seat squabs and backrest in natural wool-based ‘chiné’ mixed fabric with the side areas in aged leather. Fabric and leather are worked together in a process that optimises the use of resources. So to avoid off-cuts and waste, the fabric is shaped using clamps. This simple process is inspired by the tradition of fine gentlemen’s bespoke tailoring. The fabric then presents surfaces with crisp folds and no stitching. Leather for use in cars has always been selected for the absence of markings then tanned to make it perfect. Optimising the skins, EXALT makes use of imperfections in appearance to make each one a unique signature. Then the leathers are aged naturally, without the use of chemicals. Black ebony wood has been selected for its rare qualities and its indigenous roots to the Asian continent. It bears a motif designed by the trio PINWU Design agency; combining a lion with bamboo stems and leaves, its creation was entrusted to a Chinese master craftsman using traditional techniques. Finally, carbon fibre gives way to basalt fibre, a natural composite. Produced by smelting the basalt stone, it reduces the use of petrochemical resources. 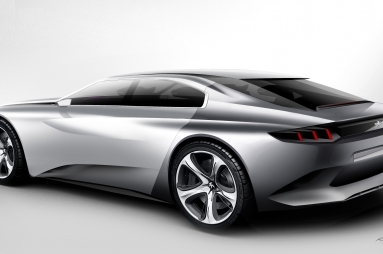 Weighing just 1,700kg, PEUGEOT EXALT is powered by a plug-in HYbrid4 drive train with a total maximum power of 340bhp shared between the four wheels. 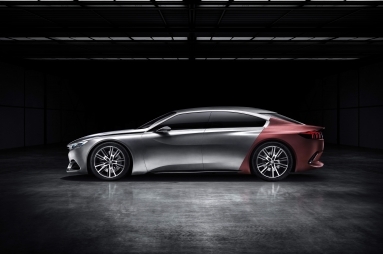 The bonnet houses the 1.6-litre THP 270bhp developed by PEUGEOT Sport. Coupled to a 6-speed automatic gearbox, this 4-cylinder petrol engine develops a specific power output of nearly 170bhp per litre, making it one of the best in the world. At the rear, the multi-link rear axle contains a 50kW electric machine for electric or hybrid phases of operation. This machine also intervenes to recharge the battery through energy recovery braking. On deceleration, braking is produced by the resistant torque of the electric machine. In this way the HYbrid4 technology converts into electricity the kinetic energy that would otherwise have been dissipated as heat through the brake discs and pads. Intelligent technology, HYbrid4 instantly adapts to the driver’s wishes by selecting the most suitable mode: pure electric, petrol only, petrol-electric hybrid. The driver feels the intensity of the journey, enjoying PEUGEOT’s expertise in road handling performance. 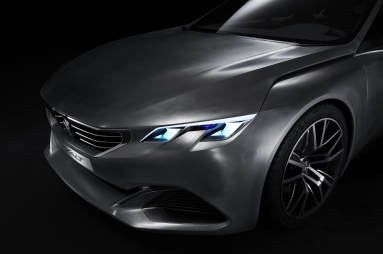 With PEUGEOT EXALT, the Brand unveils its imposing vision of the saloon. It demonstrates once again that emotion has always been at the heart of our heritage and genes.